The Indian Lotus, also known as the Sacred Lotus, is a culturally significant plant in many Asian cultures in general and Indian culture in particular. It is a plant native to the Indian subcontinent, but now is found as an ornamental plant worldwide. The Lotus is considered a symbol of devotion and purity. It is the seat of Goddess Lakshmi, Goddess Saraswati, Lord Vishnu and Lord Brahma. The flowers of Lotus have several medicinal properties as per Ayurveda. 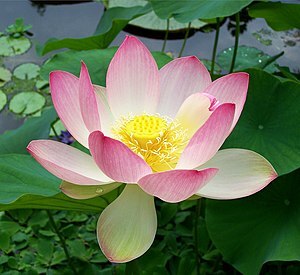 Lotus is also the national flower of India. Please note that the above slideshow is automatically created by searching Flickr and does not contain manually curated images. Hence, it is likely that some images may not be exactly of Nelumbo nucifera. Rooted hydrophyte. The plant has firm roots in the mud and flowers out of the water surface. Hence it needs shallow water bodies to grow. It grows in permanent water bodies,small ponds and shallow areas of lakes and rivers, upto altitudes of 400m. The plant adds to the dissolved oxygen in water and thus is important for the health of the flora and fauna in the water bodies. It also provides solid substrate and shade for its cohabitants. 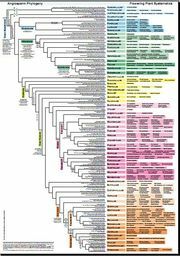 The plant is also found abundantly in China and other East Asian countries, where also it is highly culturally integrated. 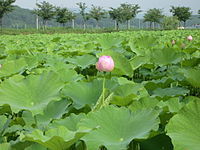 It is possible that the locus of origin of Nelumbo nucifera is the sub-Himalayan region. Organ-specific disorders Flower- astringent, in diarrhoea, cholera, diseases of liver and heart; filament – in bleeding piles and menorrhagia; rhizome in piles, dysentery, dyspepsia, and skin diseases including ring worm; young leaf in fever; seed used for local application in leprosy and other skin affections; pistil-antidote in snake poisoning, demulcent, antiemetic.Rhizomes are given to Children in diarrhoea and dysentry. Some EST sequences from this plant are available (Sep 2010). There is very little known about the molecular basis of the medicinal properties of the plant. The molecular basis of development of lotus flowers is also not clearly known. flower of Nelumbo nucifera at Botanic Garden, Adelaide, South Australia. This page was last modified on 30 April 2014, at 19:16.